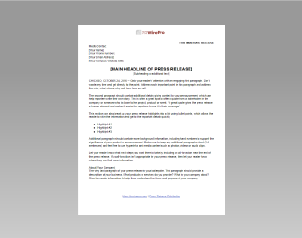 Get straight to the point: Most press releases are 1-2 pages or 400-500 words long. Only include the pertinent and actionable information to avoid losing readers before they get to your CTA. Try to write in a Journalistic Style and also get your reader’s’ attention with an engaging first paragraph and a strong call to action soon to follow. Don’t waste any time and get directly to the point. Address each important point in this paragraph and address the who, what, where, why and how here as well. Logo: Add your company logo to the top of your press release. 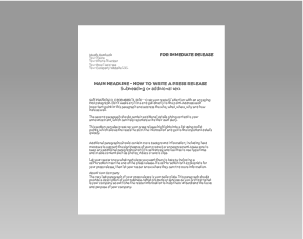 support your press release with 2-3 short body paragraphs, which can include background info, rich quotes, or a clear explanation of what the company does. Call to Action (CTA): If you want your readers to take action, include a brief, direct CTA. For example, you could advertise a free trial, include a request information form, or link to social media channels. Additional paragraphs can contain more background information, feel free to use hyperlinks and media content such as photos, videos or audio clips. Let your reader know what next steps you want them to take by including a call-to-action near the end of your press release and another link to your website.